If you have a unique bathroom, our Fontana gold shower head was made for it! It comes in two different sizes, 12” or 16”, with an optional shower arm that can be either wall mounted or ceiling mounted. The best touch is the LED lights, which are activated by the water flow, so they do not require any external power connection. The color changes according to the water temperature, so you always know what to expect and the intensity of the light varies with the water flow. This shower head is made of solid brass for a long lasting life time. It has standard connections, so it is easy to install and it comes complete with accessories and installation instructions. 2.0 - 2.5 GPM flow rate provides a steady flow of water. The threading is universal so it will fit any standard shower head by simply unscrewing the old one by hand and attaching the new one. A shower arm is not included, and can be purchased seperately. High Quality This modern shower head is made out of solid brass, so its made to last!! Showerhead Length 12" Also available in 16"
Showerhead Width 12" Also available in 16"
I was browsing through the web when I found this Fontana Gold Plated Square LED Rain Shower Head that comes with a solid brass finish. I ordered one for my kid's bathroom and they are literally going crazy with the LED lights and rain shower experience. The product was installed easily and delivers quality performance. I like this shower head. It's large enough and the LED lights are kind of good. It's nice as bright as I imagined them to be, but then I guess there's no point complaining considering how much I paid for this. I got this during the sale, by the way. Anyhow, I'm satisfied with this purchase and I think I would recommend it. It was the LED lights that actually made us by this one. Well, it was our daughter who wanted this for the bathroom upstairs, since she's the one who mostly uses it. So there, we placed an order and had it installed when it came. It actually looks great when we unboxed it. It has this nice finish which looks of good quality. The LED lights though were the star of the show. Our daughter just loves it. I bought this shower head mainly because of the gold plating and the LED lights, and I have to say, I was impressed. The gold plating finish looks lovely, although I am worried about the plating coming off or fading especially since it is always exposed to moisture and water. However, I think it will last, hopefully for the next ten years or so. The LED lights were also grand, all bulbs work well, and have no issues with them so far. Highly recommended. 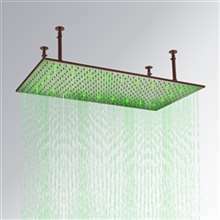 This is a lovely shower head, it not only looks good, but works beautifully too. So far we have had no issues at all with it, the water flows very well, much better than our previous model, and the falling water with the LED lights is very relaxing. The anti-scold feature has also been a wonderful addition as it's made sure shower time is safe for our children without us having to check. We also chose to purchase the shower arm which fitted our existing fitting perfectly and looks lovely.